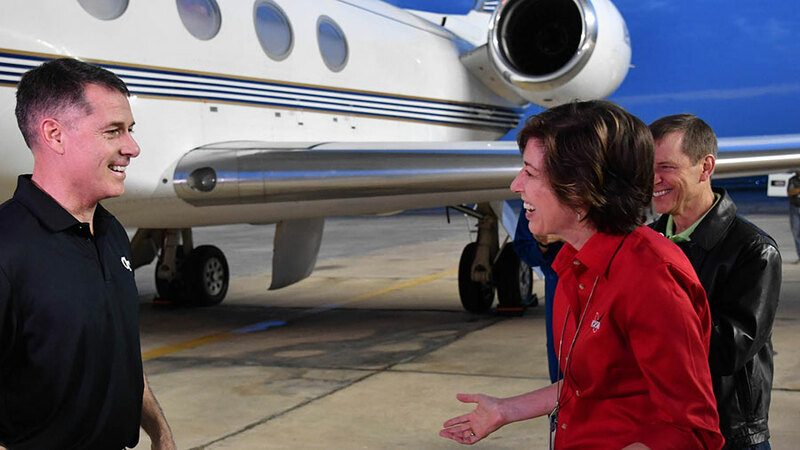 Astronaut Shane Kimbrough (left) is greeted by Johnson Space Center Director Ellen Ochoa after his arrival in Houston just 24 hours after completing his 173-day mission in space. NASA astronaut Shane Kimbrough is back in Houston just 24 hours after landing in Kazakhstan completing a 173-day mission in space. He arrived home aboard a NASA aircraft Tuesday morning while his two Expedition 50 crewmates, cosmonauts Sergey Ryzhikov and Andrey Borisenko, have returned to Moscow. Three crew members are staying behind on the International Space Station beginning the Expedition 51 mission. They are waiting for a new pair of residents to arrive in less than two weeks. Commander Peggy Whitson is orbiting Earth and leading the station crew of Roscosmos cosmonaut Oleg Novitskiy and European Space Agency astronaut Thomas Pesquet. All three crew members are busy aboard the orbital laboratory today maintaining its systems and performing critical space research. Whitson explored how new lights on the station are affecting crew performance and reconfigured science hardware with help from Pesquet. Novitskiy worked on Russian life support systems and studied ways to improve piloting spacecraft on long-term missions. Two new Expedition 51 crewmates, veteran cosmonaut Fyodor Yurchikhin and NASA astronaut and first-time space flyer Jack Fischer, will join their orbiting crewmates April 10. The duo will blast off from Kazakhstan and take a six-hour, four-orbit ride to their new home in space aboard the Soyuz MS-04 spacecraft. You saw the real milky way? No, not being sarcastic, but congrats. Congratulations on a successful mission and welcome back. Best wishes to our new astronaut in space Jack Fischer. May God bless your mission time as you contemplate the Vastness and Wonder of His Creation! The advances in technology amaze me!! Is it hard to adjust to the atmosphere here when you are gone so long? Congratulations on your safe return! The astronauts exercise about two hours everyday to stay in shape in space and prepare for the return to Earth’s gravity.